We’re an odd pair, The Social House and I.
I’m a jazz singer who prefers soft music – or none at all – when I dine. 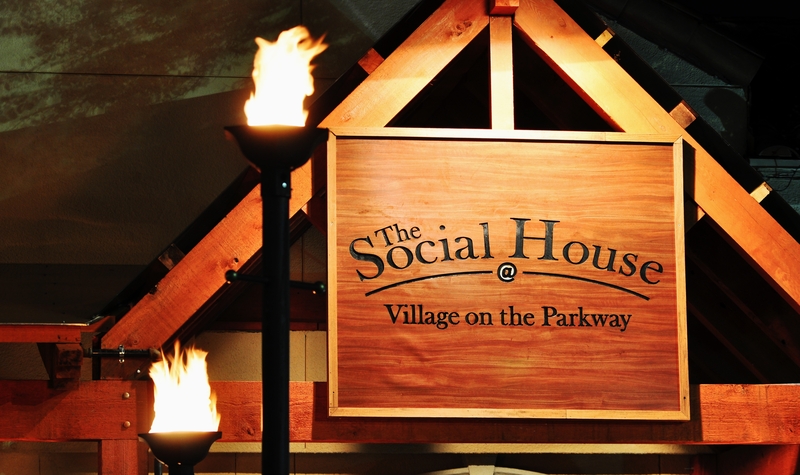 The Social House is LOUD and favors a mix of rock music that sometimes veers into hip hop. A twenty-five year veteran food critic and food snob from both the East and West Coasts, I’m usually not drawn to happy hour and party-style hangouts. Not anymore, anyway – although I will confess to having been at the opening night of the notorious nightclub Arthur in the 1970’s, the one in Manhattan that was co-owned by Beatle George Harrison, not to be confused with quaint antiquity Arthur’s Prime Steakhouse on Quorum Drive. A much newer kid in the neighborhood, and anything but past its prime, The Social House is Addison’s Party Central. Here, the party is often still going strong until 2 a.m.
Happily, the kitchen is open until 1 a.m. on weekends, which is great timing for me as I’m often out working late. 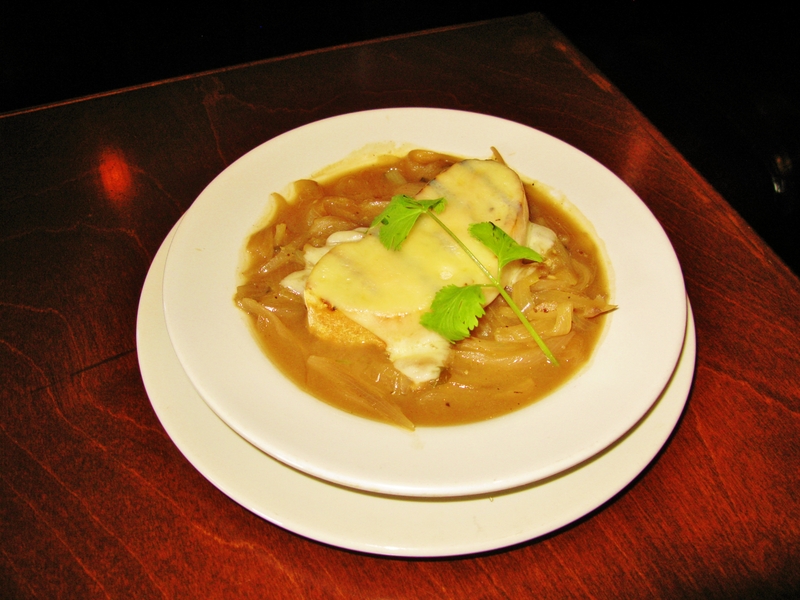 But I also stop in at The Social House in the middle of the day or evening, sometimes several times in the same week, and I’m always after the same thing: the amazing five onion soup. It’s rich, dark and delicious with a hit of Tabasco and perfectly browned cheese on top. In all the years that I’ve been reviewing restaurants, I’ve not had a better onion soup anywhere – not in New York, not in Los Angeles. Had it not been for the media alerts that their PR firm sends out – and they send out lots of them, which is good – I might never have given The Social House a second glance. Or a first glance, for that matter; the restaurant’s signage is so subtle that its near-invisibility borders on the ridiculous. Minimal signage in the middle of the sweet spot that is Addison doesn’t keep the restaurant’s fans from packing the joint every night, of course. You can bet THEY know where this place is. For his absolutely perfect French onion soup – here, it’s billed as “Five Onion Soup” – chef de cuisine Michael Weissert incorporates a veal demi glace, red, yellow, green and cippolini onions, garlic, a well-timed sauté of butter and oil, toasted bread croutons, Swiss cheese and the Tabasco into pure perfection. While he didn’t create the recipe – consulting chef Brian Olenjack did – Weissert is a capable steward of this treasure. Is Weissert afraid someone will steal the recipe? Not a chance. “It’s all in the technique,” he says. I love The Social House, where GM Mehdi Taxi is constantly on the lookout for anything possible he can do to make his customers happy, the servers are well-trained and the food is a lot better than it even needs to be, considering the place’s status as one of Dallas’ favorite watering holes. I have never had a bad meal here. The chicken fried steak is probably one of the best I’ve had, and $5.95 for that huge tasty bowl of buffalo chili is a steal. Check out the brunch on Sunday, it is awesome! A brunch served at the table, while it it hot. The Short Rib Hash is my favorite while my wife recommends the Chiliaques. A true culinary delight! So are the mussels any good? You have a picture of them but no comments about them. Please do tell….. The mussels are extremely good. This is of those places that proves you don’t have to be a zillionaire to dine well in Dallas.